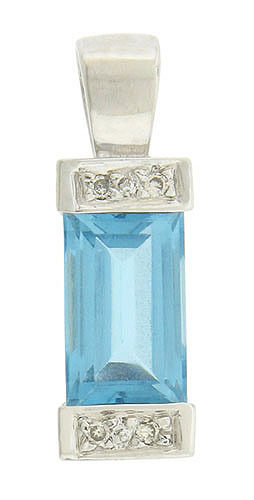 A vibrant emerald cut blue topaz is the star of this elegant 14K white gold pendant. Trios of round cut diamonds are set into the edges of the pendant. The sides of the pendant are polished smooth and adorned with bold milgrain decoration. This lovely piece measures 1" long, 3/4" wide.